Ankle Fractures | Nashville Injury Lawyers The Law Offices of John Day, P.C. The ankle joint is comprised of three bones—the tibia (shinbone), the fibula (smaller bone in the lower leg), and the talus (a small bone that sits between the heel bone and the tibia and fibula). When one or more of these bones break, it is known as an ankle fracture or broken ankle. A broken ankle is a fairly common injury that can vary greatly in seriousness. An ankle fracture can range from a simple break in one bone that has little effect on your life to several fractures, keeping you from putting weight on your foot for months and possibly requiring surgery. In general, the more bones that are broken, the more unstable your ankle will be. Ankle fractures can occur in many ways. Many of the most serious fractures are caused by car accidents, which are often due to crushing and may require surgical repair. Other ways to break your ankle include falls, trips, and overuse, or any other way your ankle may be twisted or rolled. Though the symptoms you experience will depend somewhat on the type of fracture you have, some common broken ankle symptoms include immediate and severe pain, pain that increases with activity, swelling and bruising, tenderness, visible deformity, difficulty walking or putting weight on your foot, and problems putting on or taking off your shoe. Many symptoms of a broken ankle mimic the symptoms of a sprain, so it is important that you see your doctor if the symptoms you are experiencing last more than two to three days. The treatment recommended for your ankle fracture will depend largely on what type of break you suffered. Some fractures will not require surgery, but severe or displaced fractures may. Whether surgery is required or not, most ankle fractures require therapy to help loosen the joint and increase strength and flexibility after the injury. In addition, there will be a period during which you cannot put weight on your foot, and a cast or brace may be used as your ankle heals. With proper therapy after a broken ankle, most people can return to daily activities (other than sports) within 3 or 4 months. Recovery may continue, however, for up to two years after the injury. While the ankle joint is made of the tibia, fibula, and talus bones, the tibia and fibula actually have specific parts that make up the ankle: the medial malleolus, or inside part of the tibia; the posterior malleolus, or back part of the tibia; and the lateral malleolus, or end of the fibula. In addition to these bones, multiple ligaments are present in the ankle joint. Ankle fractures are classified based on which areas of the bones are broken, and sometimes whether ligaments are also involved. Lateral malleolus fracture, which occurs when the fibula is broken. Medial malleolus fracture, which is a break in the tibia around the inside of the lower leg. These fractures often occur in conjunction with a fibula fracture, a fracture of the back of the tibia, or with an injury to the ligaments in the ankle joint. A medial malleolus fracture can include impaction, which occurs when the force breaking the bone is so great that it drives the end of the bone into another one. If the medial malleolus fracture involves impaction, treatment may require bone grafting. Posterior malleolus fracture, which is a break at ankle level in the back of the tibia. With a posterior malleolus fracture, the fibula is usually also broken. Although all broken ankles should be promptly treated, it is especially important that this type of fracture receive medical care due to the risk of developing arthritis. Bimalleolar fractures, which means that two of the three parts of the ankle have fractured, or a bimalleolar equivalent fracture, which occurs when one of the parts of the ankle has broken AND the ligaments on the inside portion of the ankle are injured. Both of these fracture types are usually considered unstable and require surgery. Trimalleolar fractures, where all three of the ankle bones break. These injuries typically require surgery. Talar fractures, which occur when the small bone between the heel bone and lower leg bones, known as the talus, is fractured. Most injuries to the talus bone result from vehicle accidents, and these injuries are often associated with lower back injuries. Most fractures of the talus require surgery to minimize the risk of complications later in life. Healing from a talar fracture can be lengthy, with many patients being required to wear a cast after surgery for up to eight weeks and being unable to put weight on the injured foot for at least three months. Pilon fractures, which occur when the bones of the ankle are crushed in a high-energy impact, such as a car accident. Due to the force required to cause this injury, both bones in the lower leg are usually broken, and 25-50% of patients with pilon ankle fractures also suffer from other injuries. Since the introduction of airbags in vehicles, doctors have seen more pilon ankle fractures, because while airbags have increased the rate of crash survival, they do not protect a driver or passenger’s legs and ankles. Following a pilon fracture, many people suffer from chronic ankle stiffness, and up to 40% develop ankle arthritis after healing from their fracture. If you have suffered a broken ankle as a result of an accident, you may have a case against a negligent party. We have a proven record of assuring that injured parties get the compensation they deserve. 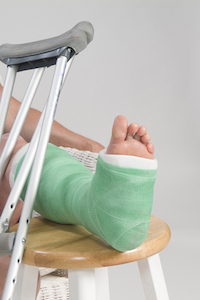 Let our experienced attorneys review your broken ankle case and determine whether we can assist you. The initial consultation is always free and without obligation. And, we handle all accident cases on a contingency basis which means we only get paid if we recover money for you. Call us at 615-742-4880 or toll-free at 866.812.8787 or fill out this online form and we will contact you.